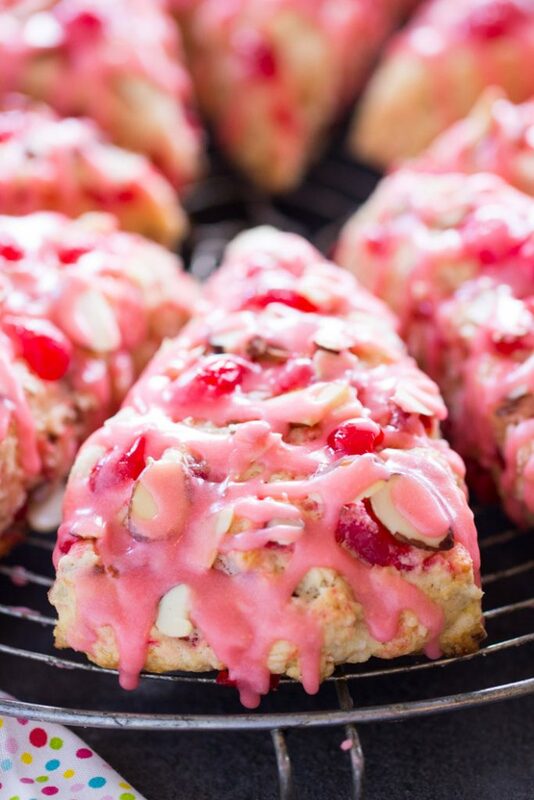 Tender, flaky scones, infused with almond extract and loaded with maraschino cherries, these Cherry Almond Scones are also topped with a cherry-almond glaze! 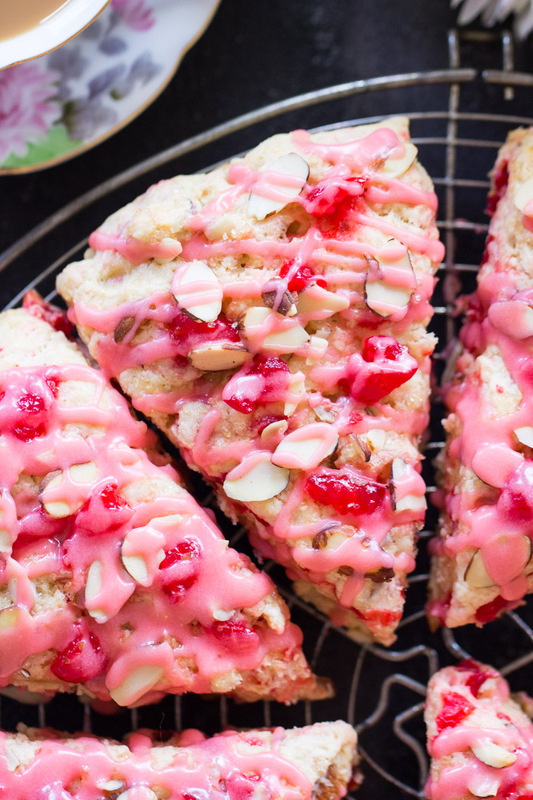 They’re ready in about 45 minutes, start to finish, so you can have homemade, fresh-from-the-oven Cherry Almond Scones whenever your heart desires! Hi, and happy Saturday! I hope you have a great weekend in store. We’re seeing The Book of Mormon tonight, one of my favorite shows. We bought tickets with some friends of ours, so we’re looking forward to a night out with good friends and good entertainment. Have you seen it?? It’s so irreverent – sometimes I can’t believe the humor – but it’s also SO hilarious! This is my second time seeing it, and I’m the only one in our group that’s seen it before, so it’ll be interesting to see everyone else’s reactions. 🙂 What does your weekend look like?? Today I’m bringing you an amazing holiday brunch recipe, these Cherry Almond Scones. 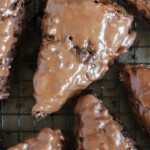 You don’t need a holiday to make these though, obviously you can make them anytime, and you definitely should. 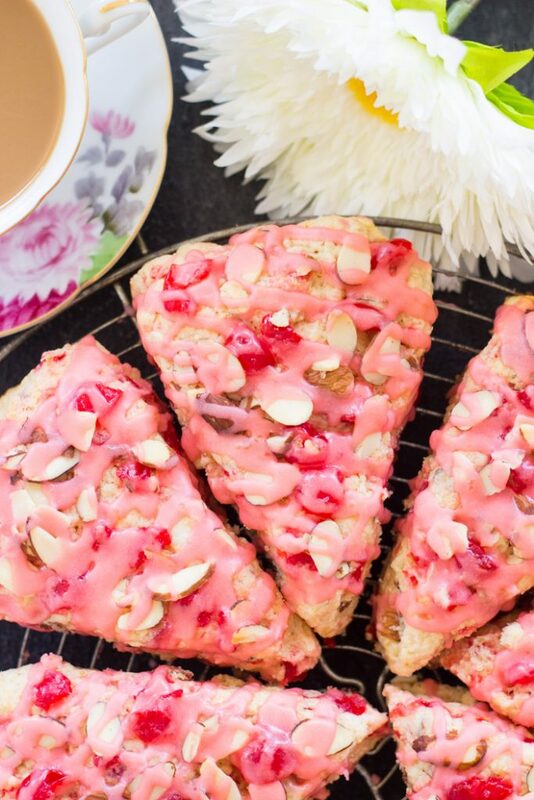 But I do think these Cherry Almond Scones would be really nice for a weekend morning in December, or even on Christmas morning. These Cherry Almond Scones come together in about 45 minutes, start to finish. They’re fresh from the oven in no time. They’re quick, but also ridiculously simple. 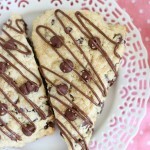 Scones are super easy, and I love the gratification of having something made from scratch in such a short time period. 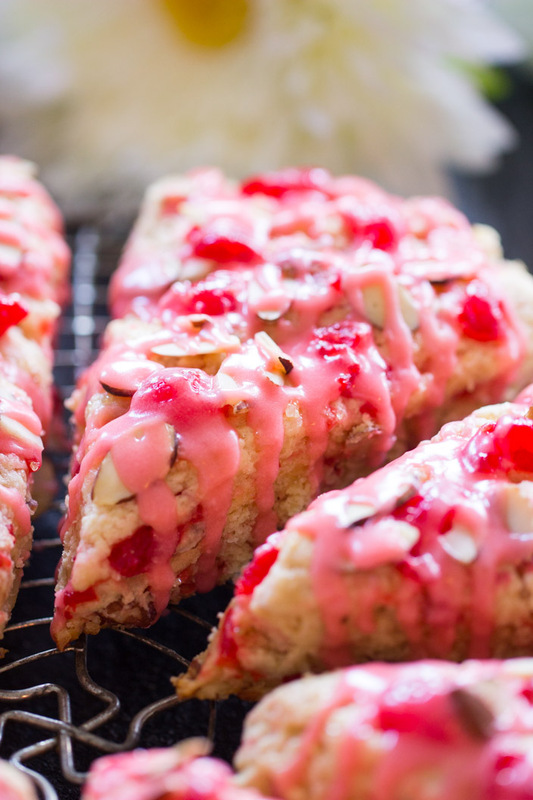 Equally important, or more importantly, these Cherry Almond Scones taste FANTASTIC. Ever since discovering the world’s best scone recipe three years ago, I’ve never been able to quit with creating a whole bunch of different variations. I have a dozen or so, least of which includes these other holiday options – Gingerbread Cranberry Scones with Brown Sugar Glaze, Cranberry Orange Scones with Orange Glaze, Pumpkin Pecan Scones with Brown Sugar Streusel, Sweet Potato Pecan Pie Scones, and Pomegranate White Chocolate Almond Scones. Yes, those are just holiday options! 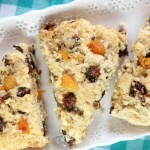 I have a bunch of other scones recipes for the rest of the year. These Cherry Almond Scones are loaded with maraschino cherries. Like, a lot. And infused with almond extract, of course. 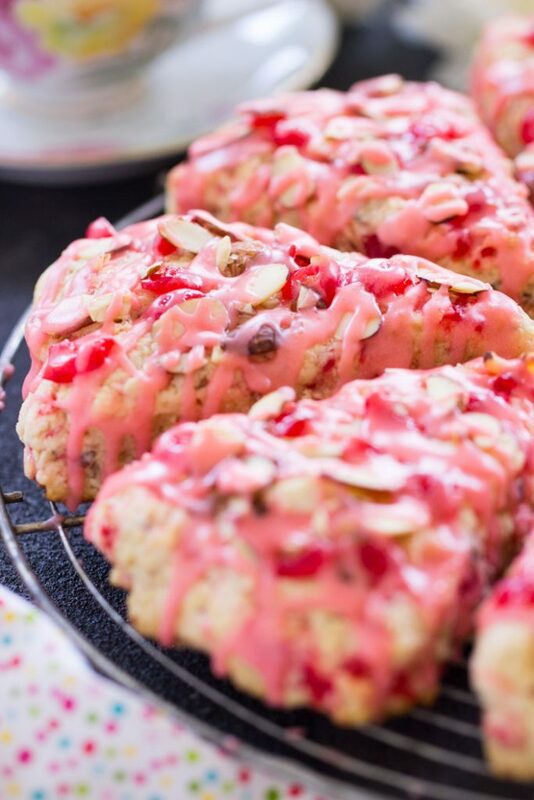 The glaze on top is a cherry-almond glaze because no Cherry Almond Scones would be complete without such a glaze… am I right? Both flavors needed to be in it! 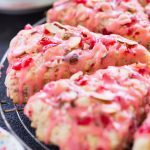 If you love cherry and almond together, I’ve got a few other recipes that feature that flavor pairing, so check out this Cherry Almond Bread with Cherry Glaze, Cherry Amaretto Bundt Cake, or White Chocolate Cherry Almond Shortbread! 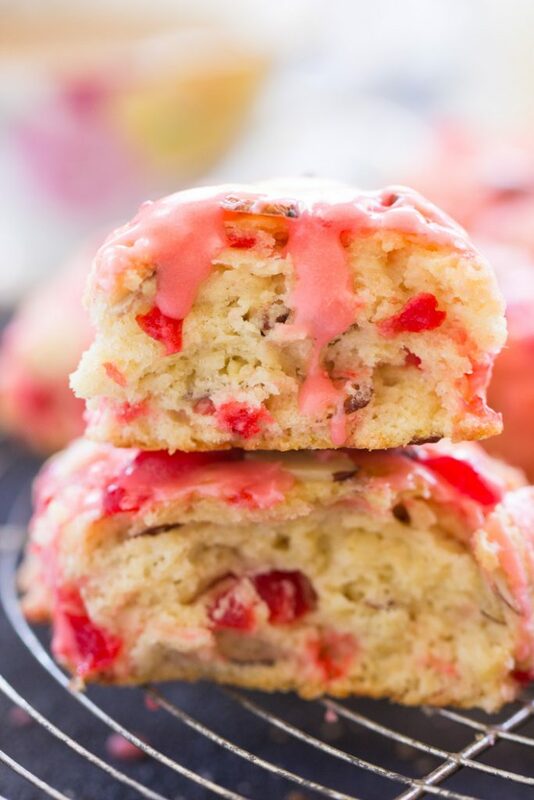 Tender, flaky scones, infused with almond extract and loaded with maraschino cherries, these Cherry Almond Scones are also topped with a cherry-almond glaze! 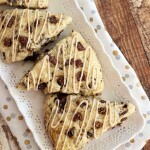 They're ready in about 45 minutes, start to finish, so you can have homemade, fresh-from-the-oven Cherry Almond Scones whenever your heart desires! Add slivered almonds and minced cherries, tossing to combine. In a small bowl, stir together eggs, heavy cream, and almond extract. Make a well in the center of the flour mixture, and pour the egg mixture into the well. Stir until just combined. Turn dough out onto a floured surface, and knead dough 5 or 6 times, slowly forming it into a large ball. Using the remaining 2 tbsp. heavy cream, brush each scone lightly. 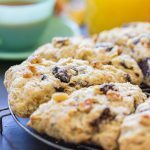 Sprinkle each scone with turbinado sugar. In a medium bowl, whisk together butter, maraschino cherry juice, almond extract, and powdered sugar. Drizzle over cooled scones. Allow to set. Serve.